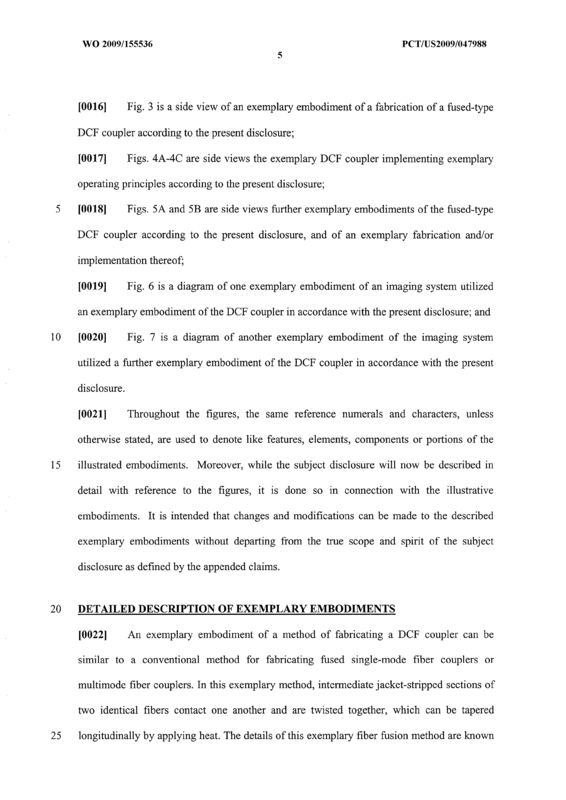 Exemplary embodiments of an article of manufacture and method according to the present disclosure are provided. 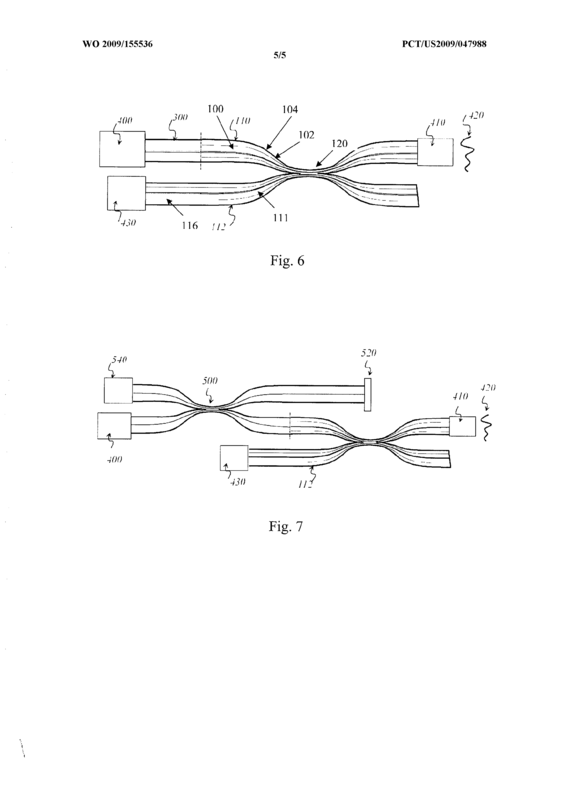 For example, a first multi-clad fiber arrangement can be provided that comprises a first core and at least one first cladding which is structured to propagate at least one first electro-magnetic radiation therethrough. 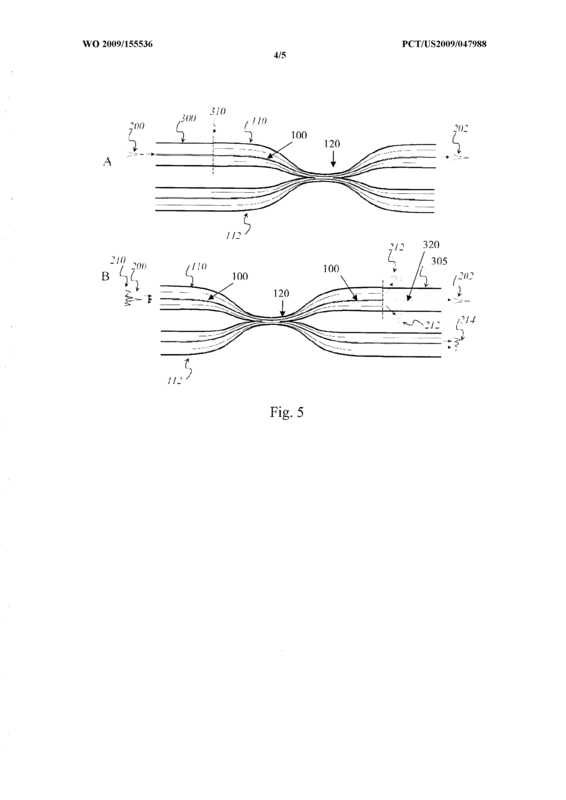 A second multi-clad fiber arrangement can also be provided that comprises a second core and at least one second cladding which is structured to propagate at least one second electro-magnetic radiation therethrough. Further, at least one portion can be provided in which the first and second claddings are fused to one another. 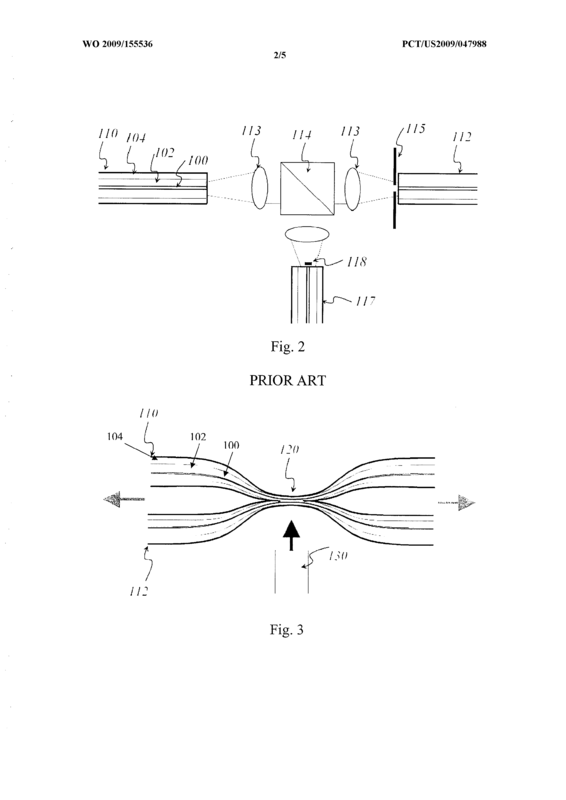 An article of manufacture, comprising: a first multi-clad fiber arrangement which comprises a first core and at least one first cladding which is structured to propagate at least one first electro-magnetic radiation therethrough; a second multi-clad fiber arrangement which comprises a second core and at least one second cladding which is structured to propagate at least one second electro-magnetic radiation therethrough; and at least one portion in which the first and second claddings are fused to one another. 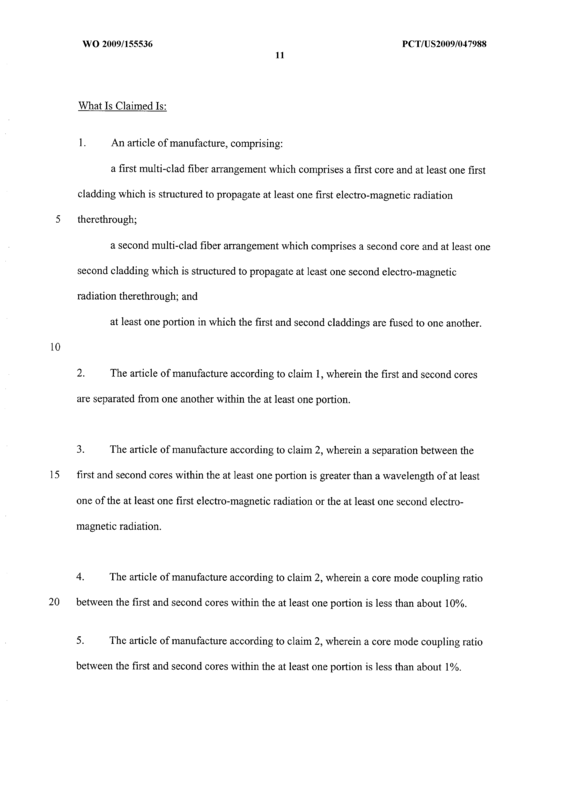 The article of manufacture according to claim 1, wherein the first and second cores are separated from one another within the at least one portion. 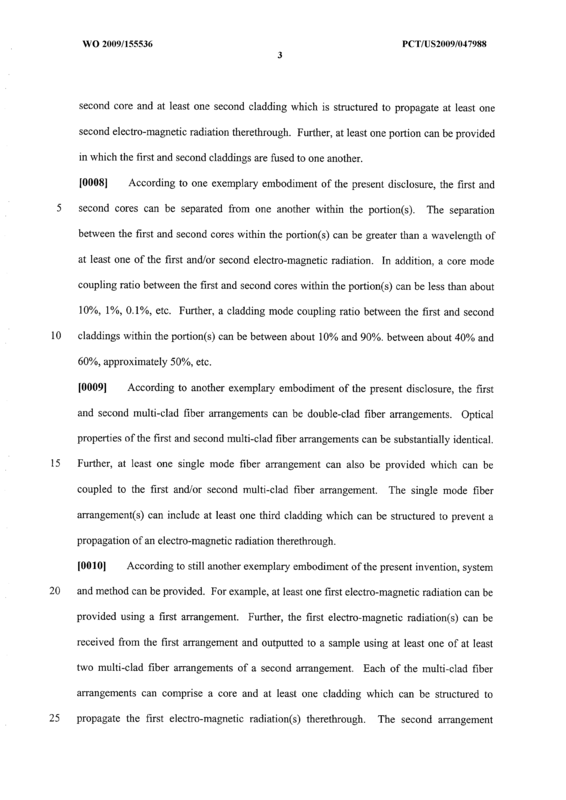 The article of manufacture according to claim 2, wherein a separation between the first and second cores within the at least one portion is greater than a wavelength of at least one of the at least one first electro-magnetic radiation or the at least one second electromagnetic radiation. The article of manufacture according to claim 2, wherein a core mode coupling ratio between the first and second cores within the at least one portion is less than about 10%. The article of manufacture according to claim 2, wherein a core mode coupling ratio between the first and second cores within the at least one portion is less than about 1%. The article of manufacture according to claim 2, wherein a core mode coupling ratio between the first and second cores within the at least one portion is less than about 0.1%. The article of manufacture according to claim 1, wherein a cladding mode coupling ratio between the first and second claddings within the at least one portion is between about 40% and 60%. 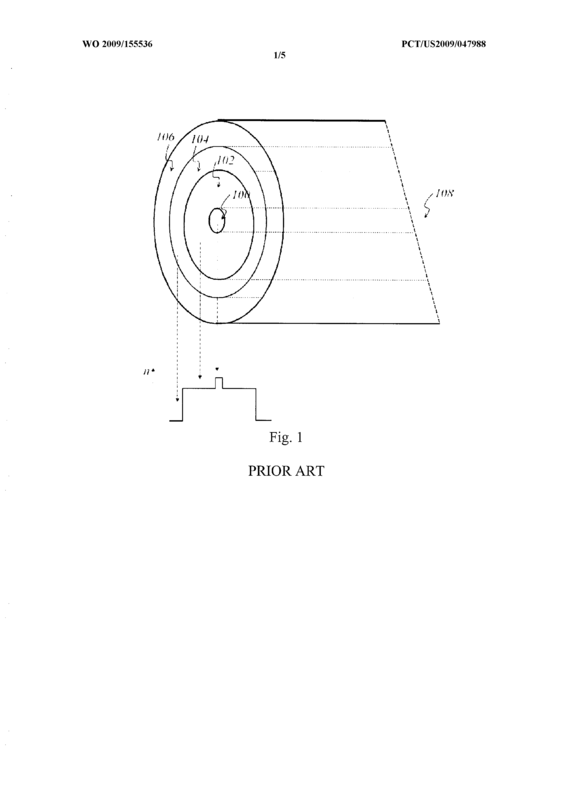 The article of manufacture according to claim 1, wherein a cladding mode coupling ratio between the first and second claddings within the at least one portion is approximately 50%. The article of manufacture according to claim 1, wherein the first and second multi- clad fiber arrangements are double-clad fiber arrangements. 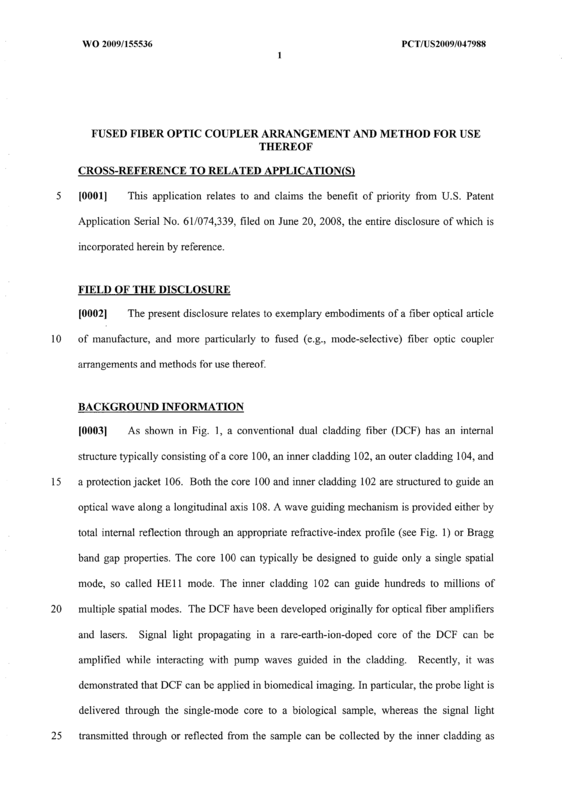 The article of manufacture according to claim 1, wherein optical properties of the first and second multi-clad fiber arrangements are substantially identical. 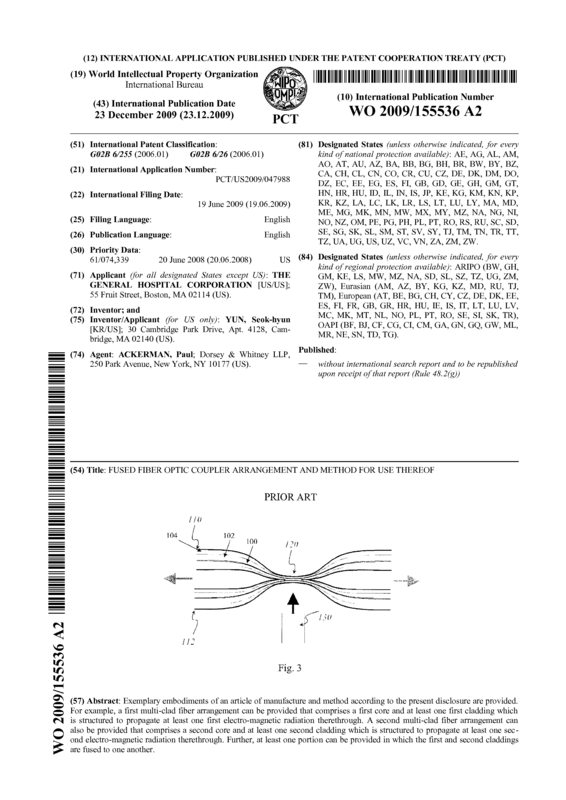 The article of manufacture according to claim 1, further comprising at least one single mode fiber arrangement which is coupled to at least one of the at least one first multi-clad fiber arrangement and the least one second multi-clad fiber arrangement, wherein the at least one single mode fiber arrangement includes at least one third cladding which is structured to prevent a propagation of an electro-magnetic radiation therethrough. 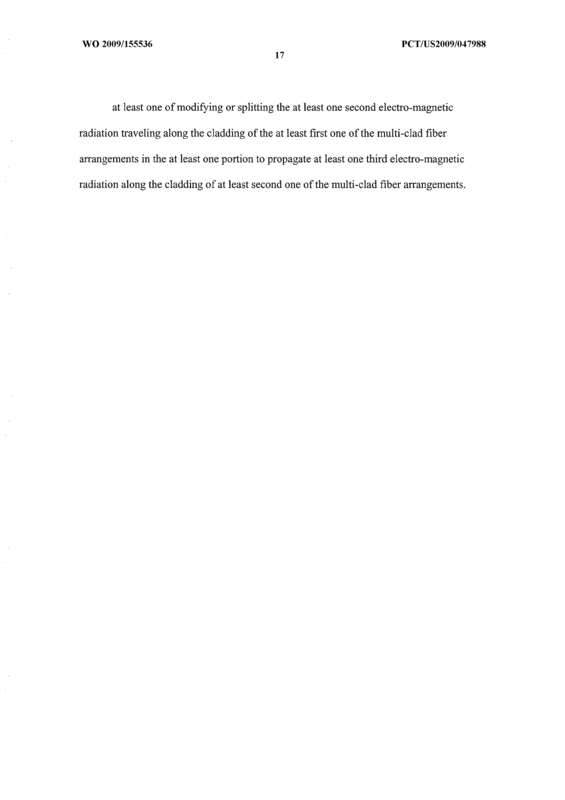 The article of manufacture according to claim 1, wherein, after transmitting the at least one first electro-magnetic radiation, the first multi-clad fiber arrangement receives at least one third electro-magnetic radiation from a sample which is associated with the at least one first electro-magnetic radiation, and propagates the at least one third electro-magnetic radiation via the core and the at least one first cladding thereof, and wherein the at least one third electro-magnetic radiation traveling along the at least one first cladding of the first multi-clad fiber arrangement is at least one of modified or split in the at least one portion to propagate at least one fourth electro-magnetic radiation along the at least one second cladding of the second multi-clad fiber arrangement. 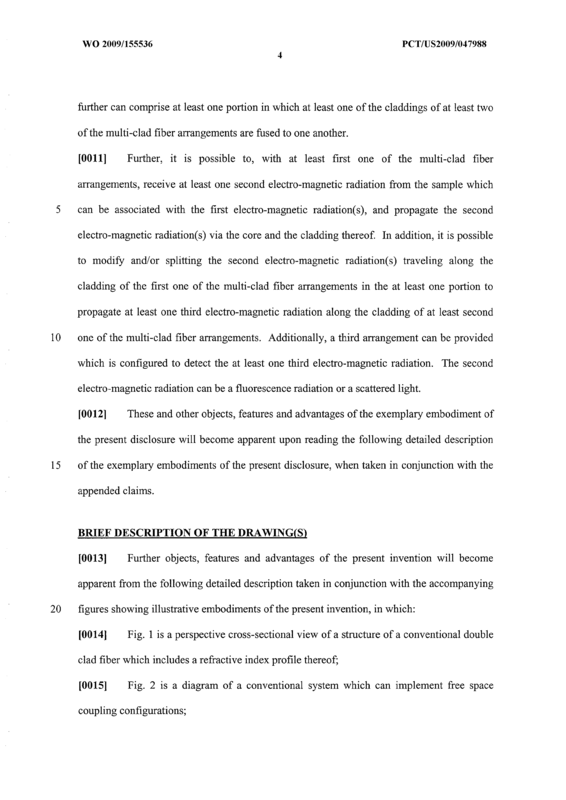 The article of manufacture according to claim 13, further comprising a third arrangement which is configured to detect the at least one fourth electro-magnetic radiation. 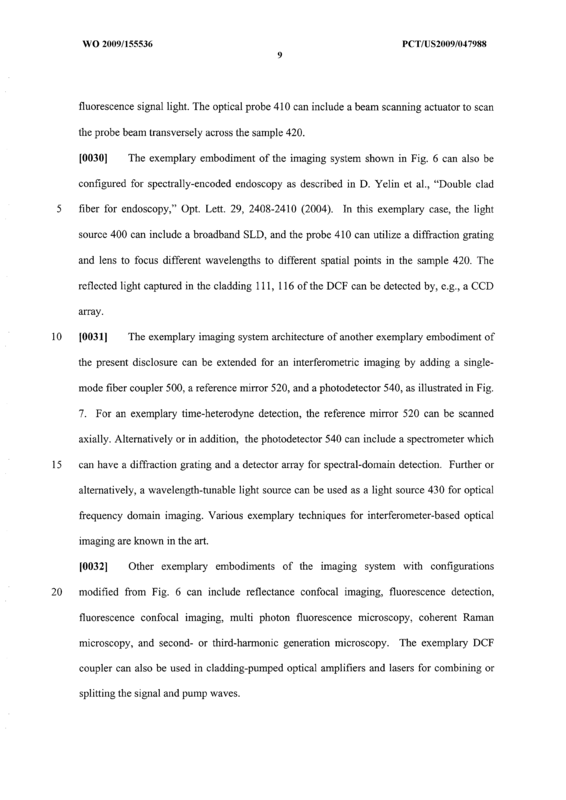 The article of manufacture according to claim 13, wherein the at least one third electro-magnetic radiation is a fluorescence radiation or a scattered light. 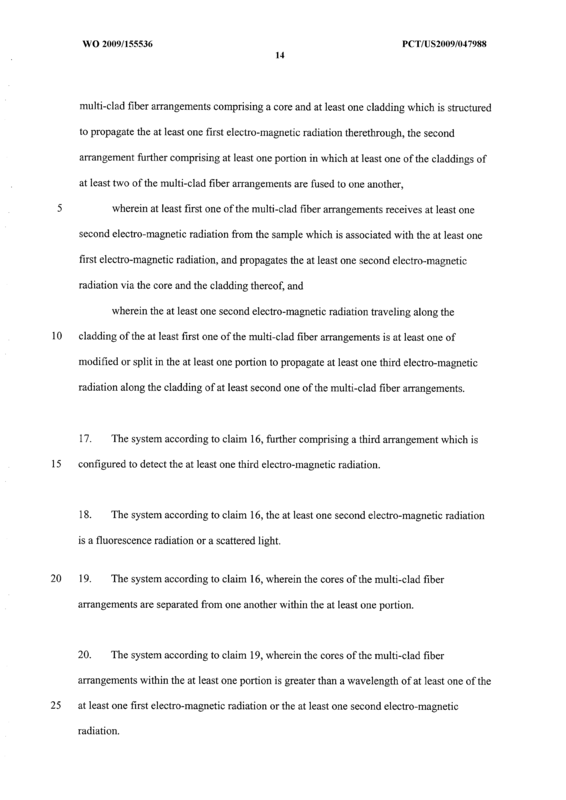 A system, comprising: a first arrangement which is configured to provide at least one first electro-magnetic radiation; and a second arrangement which includes at least two multi-clad fiber arrangements at least one of which receives the at least one first electro-magnetic radiation from the first arrangement and outputs the least one first electro-magnetic radiation to a sample, each of the multi-clad fiber arrangements comprising a core and at least one cladding which is structured to propagate the at least one first electro-magnetic radiation therethrough, the second arrangement further comprising at least one portion in which at least one of the claddings of at least two of the multi-clad fiber arrangements are fused to one another, wherein at least first one of the multi-clad fiber arrangements receives at least one second electro-magnetic radiation from the sample which is associated with the at least one first electro-magnetic radiation, and propagates the at least one second electro-magnetic radiation via the core and the cladding thereof, and wherein the at least one second electro-magnetic radiation traveling along the cladding of the at least first one of the multi-clad fiber arrangements is at least one of modified or split in the at least one portion to propagate at least one third electro-magnetic radiation along the cladding of at least second one of the multi-clad fiber arrangements. 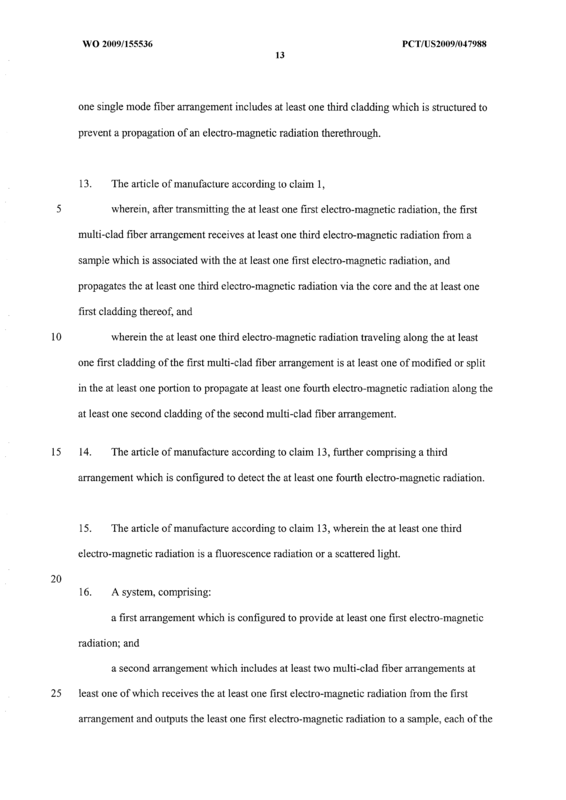 The system according to claim 16, further comprising a third arrangement which is configured to detect the at least one third electro-magnetic radiation. 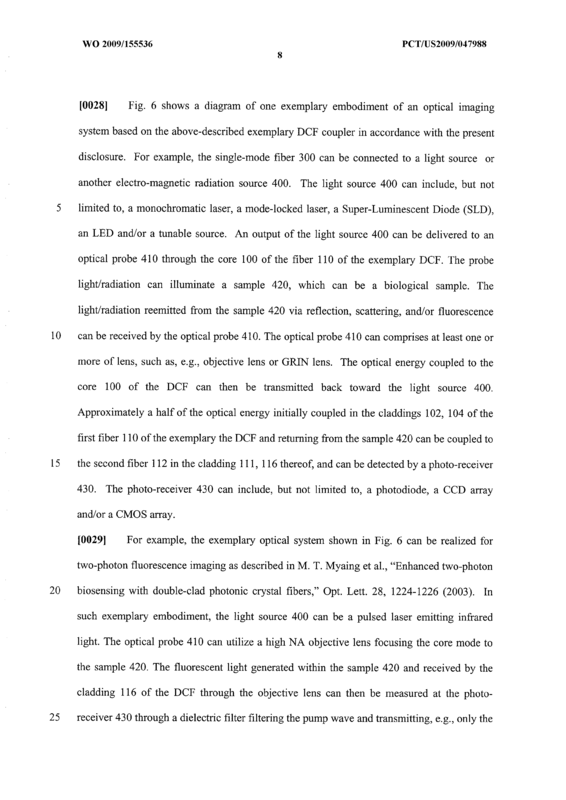 The system according to claim 16, the at least one second electro-magnetic radiation is a fluorescence radiation or a scattered light. 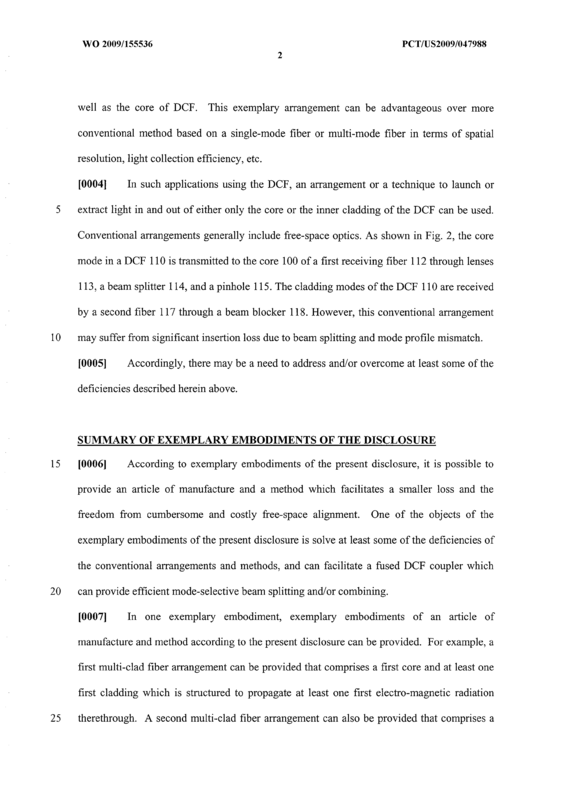 The system according to claim 16, wherein the cores of the multi-clad fiber arrangements are separated from one another within the at least one portion. 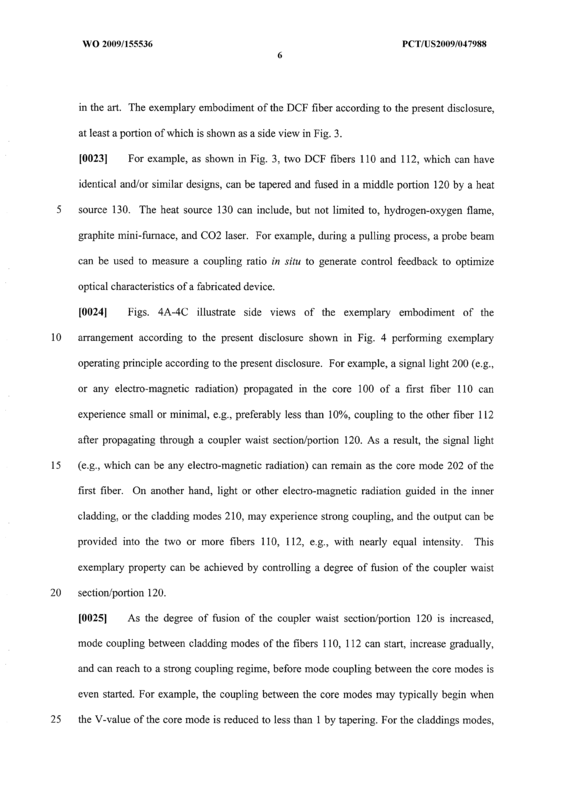 The system according to claim 19, wherein the cores of the multi-clad fiber arrangements within the at least one portion is greater than a wavelength of at least one of the at least one first electro-magnetic radiation or the at least one second electro-magnetic radiation. 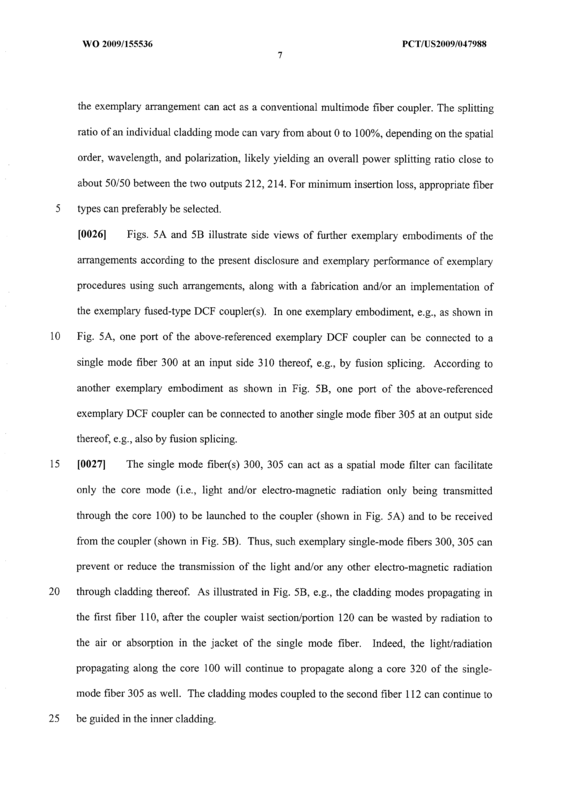 The system according to claim 19, wherein a core mode coupling ratio between the cores of the multi-clad fiber arrangements within the at least one portion is less than about 10%. 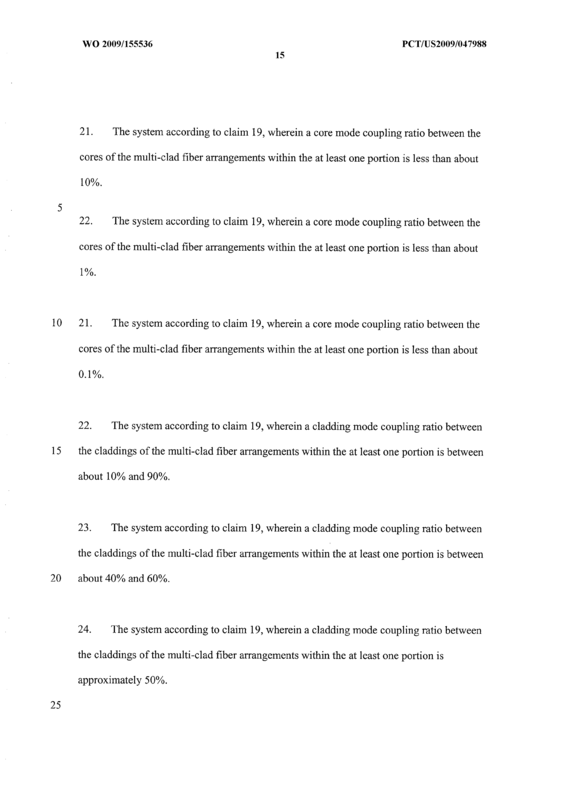 The system according to claim 19, wherein a core mode coupling ratio between the cores of the multi-clad fiber arrangements within the at least one portion is less than about 1%. The system according to claim 19, wherein a core mode coupling ratio between the cores of the multi-clad fiber arrangements within the at least one portion is less than about 0.1%. The system according to claim 19, wherein a cladding mode coupling ratio between the claddings of the multi-clad fiber arrangements within the at least one portion is between about 10% and 90%. The system according to claim 19, wherein a cladding mode coupling ratio between the claddings of the multi-clad fiber arrangements within the at least one portion is between about 40% and 60%. The system according to claim 19, wherein a cladding mode coupling ratio between the claddings of the multi-clad fiber arrangements within the at least one portion is approximately 50%. 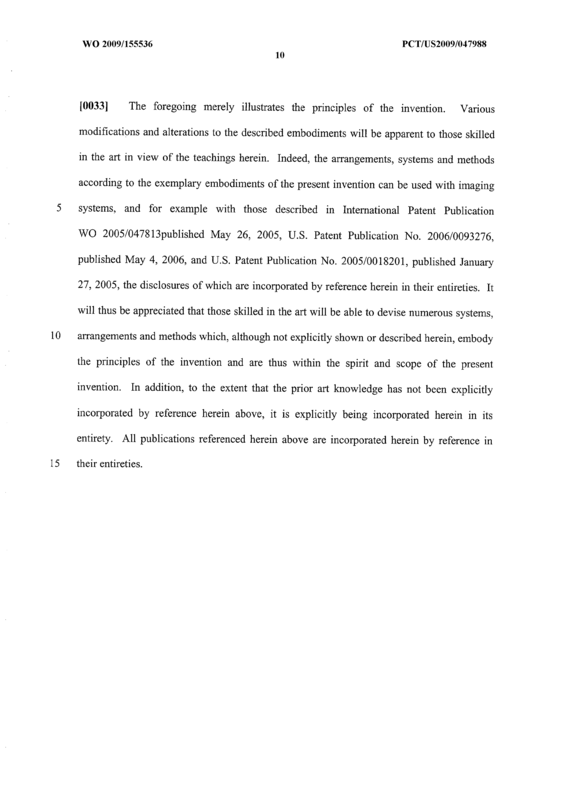 The system according to claim 16, wherein the multi-clad fiber arrangements are double-clad fiber arrangements. 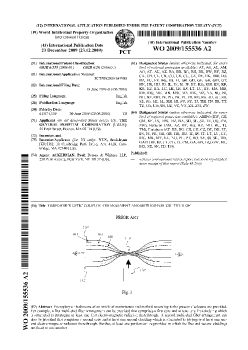 The system according to claim 16, wherein optical properties of the multi-clad fiber arrangements are substantially identical. 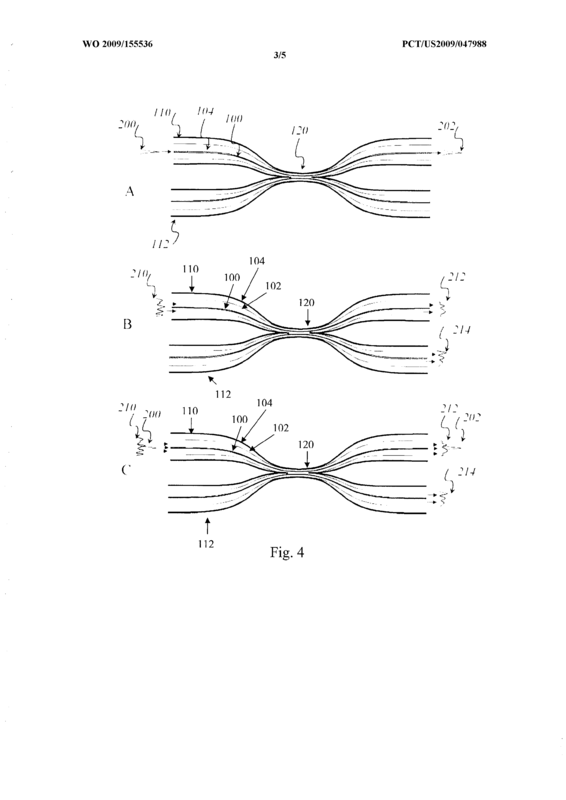 The system according to claim 16, further comprising at least one single mode fiber arrangement which is coupled to at least one of the multi-clad fiber arrangements, wherein the at least one single mode fiber arrangement includes at least one further cladding which is structured to prevent a propagation of at least one of the at least one first electro-magnetic radiation or the at least one second electro-magnetic radiation therethrough. 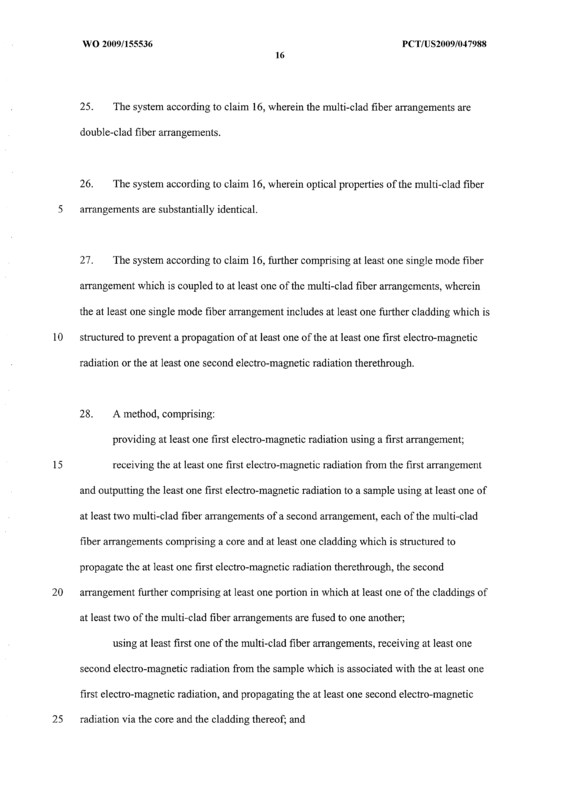 A method, comprising: providing at least one first electro-magnetic radiation using a first arrangement; receiving the at least one first electro-magnetic radiation from the first arrangement and outputting the least one first electro-magnetic radiation to a sample using at least one of at least two multi-clad fiber arrangements of a second arrangement, each of the multi-clad fiber arrangements comprising a core and at least one cladding which is structured to propagate the at least one first electro-magnetic radiation therethrough, the second arrangement further comprising at least one portion in which at least one of the claddings of at least two of the multi-clad fiber arrangements are fused to one another; using at least first one of the multi-clad fiber arrangements, receiving at least one second electro-magnetic radiation from the sample which is associated with the at least one first electro-magnetic radiation, and propagating the at least one second electro-magnetic radiation via the core and the cladding thereof; and at least one of modifying or splitting the at least one second electro-magnetic radiation traveling along the cladding of the at least first one of the multi-clad fiber arrangements in the at least one portion to propagate at least one third electro-magnetic radiation along the cladding of at least second one of the multi-clad fiber arrangements.